It’s time for my weekly $50 Target WOW Gift Card Weekend Giveaway! Every week I load $50 onto an extra fun Target Gift Card. These special gift cards all have some kind of fun twist to them and are now retired and can no longer be purchased in store or on Target.com. This week’s WOW Gift Card is super fun as it serves as a reusable bubble blower as well as a gift card! 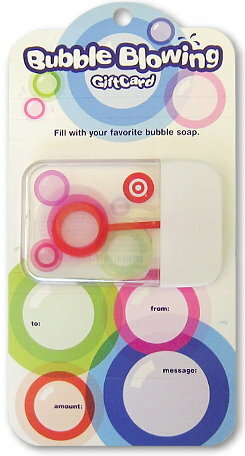 All you have to do is fill it with your favorite bubble soap. It’s a great time of year for your kids to have tons of fun blowing bubbles! 🙂 This adorable gift card is sure to make anyone smile and the best part is it will come loaded with $50 for the winner to spend! I’m already a TT fan on FB. I am a Totally Target Facebook fan! I want it pick me! Wow is right! What a great gift! Cute, cute, cute!! Love target for groceries and everything else. What a totally fun idea for a gift card!! def already a tt fb fan..thanks! I love Target! You can get such great deals! Thaks for all your hard work so we all can save! mama needs to go shopping at target! woo need a target gc! Love Target, pick me, pick me……..PLEASE! So cute! Love the card. Oh would I love this! Wow, I would totally love to win this. The best gift card ever!!! Yay! What a fun card! Thanks for the chance to win a Target gift card. Just got back from there a little while ago. The best gift card ever! !